Yet, I was really taken with Golden Sail (a 2003 beencha, and no that’s not all that old for a beencha) at the time and decided i needed to buy some during my last trip to Goldfish in November. Golden Sail 2003 is, well exactly what Pu-erh should be. The liquor is a perfect brown-tinged rust. In aroma it’s dirty and earthy–a smell similar to peat moss or freshly turned compost with maybe a hint of marigold. I know, i know, for most of you that’s not awfully attractive, but bear with me. In flavor… hmm… yeah let’s skip flavor for the moment. The strongest character of Golden Sail 2003 is its texture. In much the same way the beencha cake flakes away, Golden Sail 2003 slips ponderously over the tongue, dragging the liquor over the tastebuds like a sledge. You kind of want to swish it forever in your mouth and never swallow (and cringe and at the thought of what it’s doing to your teeth). Flavor-wise, Golden Sail 2003 is unsurpassed. It’s dank and moldy, think a cheese cellar. A taste that can only really be compared to fresh tree bark slowly gives way to a wild molasses (is that a thing?). Astounding. 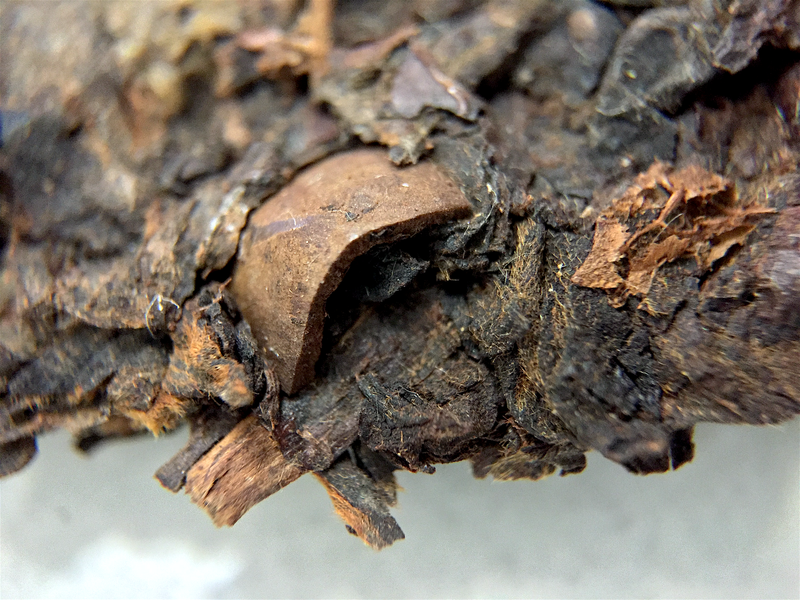 Golden Sail 2003 is the perfect example of Pu-erh improving with age. It would have taken a Best in Class as it easily surpasses Shai Qing 2003, but compared to Golden Sail 2003, you won’t be able to get your hands on Saiqing 2003, and that really has to count for something. My cat hates them both equally. Golden Sail 2003 (Goldfish) ~ cake by Jocilyn Mors is licensed under a Creative Commons Attribution-ShareAlike 4.0 International License. Golden Sail 2003 (Goldfish) ~ cake macro 14x by Jocilyn Mors is licensed under a Creative Commons Attribution-ShareAlike 4.0 International License. Golden Sail 2003 (Goldfish) ~ cake macro 21x by Jocilyn Mors is licensed under a Creative Commons Attribution-ShareAlike 4.0 International License. The smaller you go, the more amazing it is. Golden Sail 2003 (Goldfish) ~ spent by Jocilyn Mors is licensed under a Creative Commons Attribution-ShareAlike 4.0 International License. Golden Sail 2003 (Goldfish) ~ liquor by Jocilyn Mors is licensed under a Creative Commons Attribution-ShareAlike 4.0 International License. Golden Sail 2003 (Goldfish) ~ ikillyou! by Jocilyn Mors is licensed under a Creative Commons Attribution-ShareAlike 4.0 International License.